Thomas Oboe Lee is a Boston-based composer whom I have always associated with an aesthetic I sense is prevalent in the city: a belief in hybrids between learned and vernacular musics. I use those terms "learned" and "vernacular" deliberately, instead of "classical" and "pop," because that's the tone of Bostonmore academic, scrupulous, and Eurocentric than most of the rest of America. Syntheses tend to get cleaned up there, rough edges ironed out, good taste asserting itself against too much raucousness. Which does not mean good music can't come out of the process. Lee's growth as an artist has been steady throughout a 20-year span, and his approach ultimately avoids many of the pitfalls that lurk for a composer undertaking his sort of project. The very first work on the CD, Morango . . . Almost a Tango, dates from 1983, and is a very elegant character piece. It lives up to its title by not trying to be a tango in any literal sense; instead, it's like a shadow of that source. Seven Jazz Pieces, from 1991, is devoted to a compressed beauty and lyricism. The whole thing is also a bit hauntinghomages and elegies to Horace Silver, Bill Evans, Antonio Carlos Jobim, and Jaco Pastorius constitute individual movements. So what if it's not as raw as jazz is supposed to be now? That whole construct itself is just that, and if jazz really is as it's supposed to be, then it can also be a source for tender, elegant, and precisely constructed art, which is what these pieces are. But the real star of the show is the 1996 string quartet Art: Arias & Interludes. Its five movements are portraits of characters from the Italian commedia dell'artePulcinella, Pierrot, Columbine, Harlequin, and Pantaloon. Perhaps the fact that the music is drawing its inspiration from a popular art form shrouded in time and distance gives the composer greater freedom to assert his personality. The second movement, "Pierrot's Dream," revisits the world of Morango, but 13 years later Lee's vision has deepenedthe music is just as mysterious, just as langorous, but also less predictable. The music's rhythmic gestures, its jazzy-tinged harmonies, and its dancy underpinnings all feel less derivative than before. It is fresher, more personal, and yet also more "classical." The Hawthornes perform flawlessly. Listening to this disc reminds me that we are perhaps in something of a golden age for string quartets. Lee is a composer who's stayed the course. His own instincts are clearly in tune with certain populist and postmodernist tendencies, but he's also interested in developing an individual, integrated voice. This disc suggests that he's right on schedule in his project. Robert Carl teaches composition at the University of Hartford's Hartt School of Music. His review, which appeared in the July/August issue of Fanfare, is excerpted by permission of Fanfare. Thomas Oboe Lee has taught music at Boston College for the past 12 years. 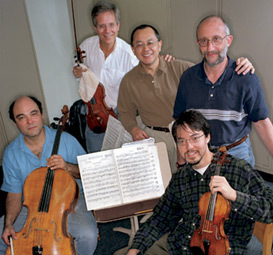 The Hawthorne String Quartet became the University's string-quartet-in-residence in 1998.